APPAssureD – Dell AppAssure Backup Plugin For LabTech LabTech Plugin -> Office 365 UM keeps improving with new features. Squidwork’s garage has released version 1 of their new IPBlock for Labtech RMM. 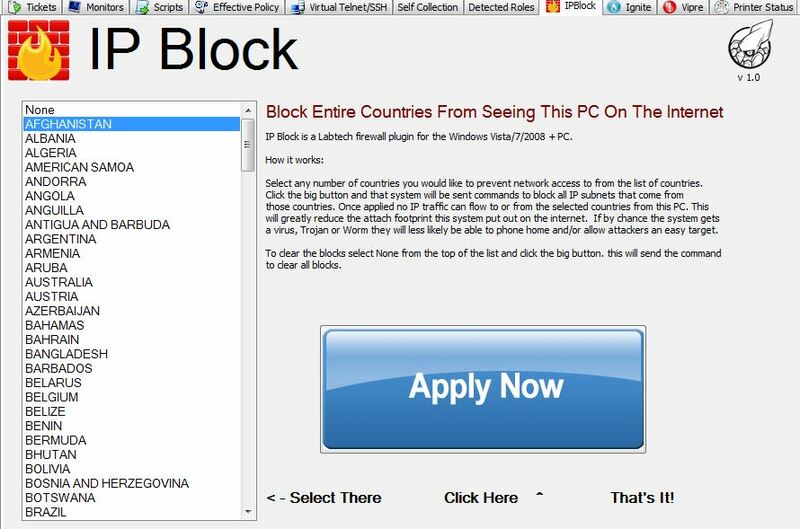 IPBlock is a Country based Network Firewall plugin for Windows based systems. When deployed you can select different countries you do not want to have access to your IP address for any Windows Vista / 7 / 2008 or new system and block them from network access to your PC. The plugin launches a script that goes out and refreshes a complete list of all countries and any IP ranges assigned to those countries. It imports them into the local host and stores them in zone files inside the LTSvc directory. Then based on your selection it applies each zone to the Windows firewall as a rule set. This greatly reduces your Internet footprint and attack surface. Preventing access from countries that have large amounts of attacking systems. It also reduces your ability to be fully exploited by Trojans, Virus or Worms as if infected it makes it much harder to “Phone Home” if the attack comes from a Country you have blocked like “China”. Version 1 only controls the lists that are applied to your PC it does not turn on or off the actual firewall on Windows. You will need to turn on firewall through the Windows control panel for rules to actually take effect. Then to stop the filtering shut down Windows firewall or go into plugin and select “None” and apply for all rule sets placed in by IPBlock to be removed. When I’m testing this plug-in on my test virtual machine the script fails after the part where it applies blocks for “region”. Below is the information it gives me on the failed part. Let me know if you need any more information. Justin you need to set your execution policy to unrestricted. Doesn’t mater though because this plugin does not work . Guys, can you provide the OS specs your using along with Powershell version? The Pc is running Powershell version 2.0 / Windows 7 64x. And just to confirm I need to have the windows firewall enable for this to work – is that a correct statement?. Has anyone been able to get this to work properly? Cubert, I would really like to use this for our clients. How much would it cost for you to work with me to get this plug in working?